A Mexican-inspired recipe for skirt or flank steak with a marinade made of fresh fruit juice, garlic, jalapeno, cilantro, and more. Place all the ingredients except the steak in a blender. Blend on high until combined. Place the steak in a large plastic zip top bag. Pour the marinade from the blender into the bag. Seal the bag and place in the refrigerator. Allow steak to marinate for at least 2 hours or overnight. Remove the steak from the refrigerator and allow it to get to room temperature (about 1 hour). Heat a grill to medium-high heat. Remove the steak from the marinade and grill the steak a few minutes on each side to desired doneness. Discard marinade. Transfer steak to a serving platter, cover, and let rest for 10 to 15 minutes. Serve and enjoy. 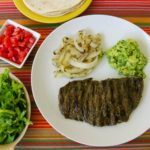 A Mexican inspired recipe for skirt or flank steak with a marinade made of fresh fruit juice, garlic, jalapeno, cilantro, and more.